To support the activities of the Alumni Association, three fundraisers were established in recent years. One is a purple ornament with a gold interlocking SM on one side and a likeness of the former St. Marys High School on the other. The second item is a book, I Am Barkwill, written by Kaki Reckard Abicht which depicts an elf returning to St. Marys and visiting many of the city’s founding fathers. The third item is a brick from the former St. Marys High School building. When the school was demolished, the Alumni Association, with the help of the Pleasants County Schools secured a limited number of the bricks. They were cleaned and prepared for sale. The ornaments and the bricks are $10 each. The book sells for $15. If purchased together, all three are just $30. The items are available at Phillips Pharmacy, the Greenhouse and from Alumni Association members. 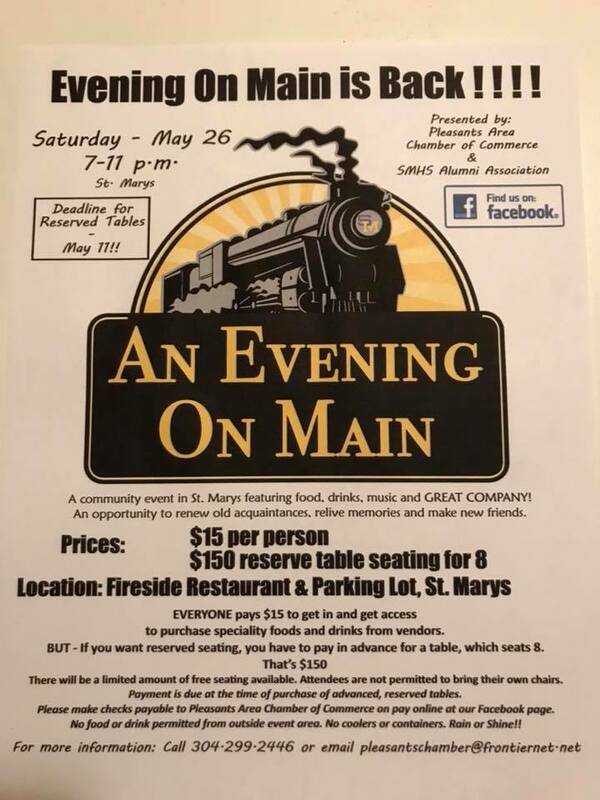 Mark your calendars and make your plans...Evening On Main is back!! Same weekend, same time, same place! Sure to be a great time for SMHS alumni and friends! Everyone is welcome to join in on the festivities of the weekend!